The Greek islands number from 1,200 to 6,000, while the inhabited ones range from 166 to 227. Each one has the turquoise waters of the Mediterranean area, and beaches galore. Though, each also has its own style and culture. Today we’re going to look a few islands the traveler will enjoy in a relaxing and romantic way. Thanks to Celestyal Cruises, today you’ll learn all about why these islands are the perfect getaway. Crete is the largest, and most populated of the Greek islands. This island is a very popular spot for holiday destinations for travelers from all around the world, with more than 2 million tourists visiting per year. The capital of Crete is Heraklion, which has many activities in, and around, the city. The Heraklion Archaeological Musuem houses the most important finds from Minoan excavations across the island of Crete. There are statues of ancient gods and jewelry from long-forgotten times. The Palace of Knossos is a Minoan palace famous for being the seat of the legendary Cretan king Minos. It was the ceremonial and political centre of Minoan civilization and culture, and features great columns and a throne room. There are also areas of the island for rock climbing, horseback riding, and sailing. 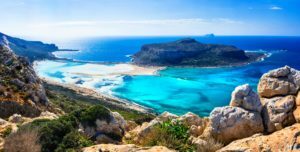 With a mild climate almost all year long, Crete is a great getaway for any traveler. Santorini is one of the most iconic and romantic of the Greek islands. It is a shining example of beauty the first time the traveler sees the whitewashed houses terraced along multicolored cliffs. Fira is the island’s capital, from there the traveler can explore villages called Firostefani and the highest point of the clifftops called Imerovigli – all within walking distance of each other. Around these three locations; the traveler can find upmarket hotels, restaurant terraces, and many points to view the gorgeous sunsets of this island. Santorini is also known for its dry, white wines and a sweet, strong wine call Vinsanto (“holy wine”). While on the north of the island, the exclusive village of Oia offers the best of the best when it comes to views of the sunsets. Rhodes is one of the larger Greek islands, and one of the most visited. Known as the “Island of Roses” for the many Rock roses growing on the island. With some white sand beaches and some gravel, Rhodes has over 300 days of sunny days per year. On the beaches, you’ll also find activities such as snorkeling, diving, and surfing. The city of Rhodes has an area named Rhodes Old Town, and is a UNESCO World Heritage Site for being one of best preserved medieval towns in Europe. In this heavily fortified area is the Palace of the Grand Master of the Knights of Rhodes, the Archbishops Palace, and Annunciation church. All of these will bring the traveler back to a different time. Rhodes also has many clubs and taverns for the more party-centric of travelers, and the Acropolis of Rhodes ruins for the history buff. Just off the Turkish coast is the island of Samos. Its capital is Vathi, also called Samos. The main attractions are the Temple of Hera and the relaxing beaches. The Temple of Hera, also known as the Heraion of Samos, is a large sanctuary in the south of the island dedicated to the goddess Hera. This ancient site has one, lone column standing from its original structure; and is considered a UNESCO World Heritage Site. The many beaches of Samos have clear waters, and are perfect for relaxing stress away. Another main highlight of Samos Island appeals to the adventurer. With 45 hiking routes across the island, rock climbing, adventure tours for rappelling down the walls of a gorge, and eco-tours of the local landscape – Samos can be for the relaxed or adventurous traveler. 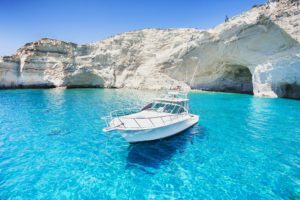 There are many options when choosing between the paradise that makes up the Greek Islands. Through all of them are beaches with clear-blue water and moderate temperatures. Fortunately, the traveler doesn’t have to choose just one with Celestyal Cruises, as they offer cruises that stop by the islands mentioned in this article and many more along their voyages. Save up to $600pp (fares from $1199pp^), 50% OFF 3rd & 4th Guests, and kids sail FREE*! Sail into these early-bird specials! Book your 2019/2020 7-Day Eastern Mediterranean cruise by June 30th, 2018 and save BIG: Up to $600pp off, 50% off 3rd and 4th guests, and kids sail free*! Pamper yourself with your choice of three memorable and immersive itineraries: Idyllic Aegean, Eclectic Aegean, and 3 Continents. Sail into these last minute deals! 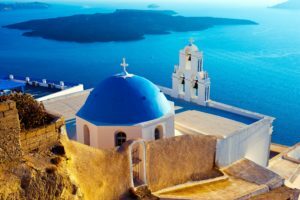 Book your October/November 2018, 3 & 4-Day all-inclusive Iconic Aegean cruise by June 30th, 2018 and save BIG: Up to $560pp^. Pamper yourself with your choice of two memorable and immersive itineraries aboard the beautiful Celestyal Olympia! Cruises should be fun, carefree and enjoyable. An experience you always remember. That’s why all of our cruises feature all-inclusive drink packages, all meals onboard, entertainment and comfortable cabins, selected shore excursions,port and service charges and gratuities.